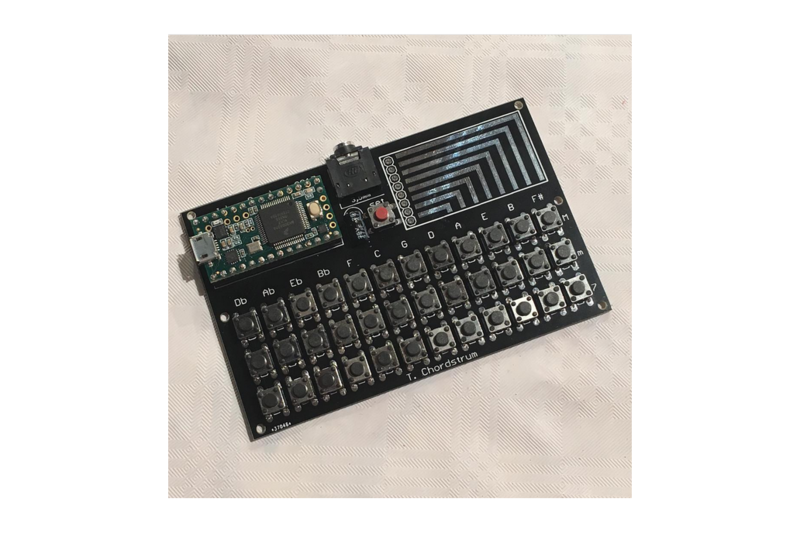 T. Chordstrum is a pocket size USB MIDI chord strummer, to be played similarly to an autoharp or omnichord. It is made as a kit for assembly and pairing with a PJRC Teensy microcontroller board that is not included in the kit, and must be bought separately. The kit can be put together in two different ways, either with a Teensy LC for brains giving it USB MIDI capability only, or with a Teensy 3.2 giving it built in audio through a 3.5mm line level jack (in addition to the USB MIDI). The strumming area consists of eight touch pads (or “strings”) that play notes of the chord selected. The chord to be played is selected using the buttons of the chord keyboard. The keyboard is setup in Circle of Fifths order, putting chords most frequently used together next to eachother. The top row selects Major chord, mid row selects minor chord and bottom row selects 7th chord. You can use combinations of these to select other chords. *) These parts and the “set” tact switch can be left out if building the more simple Teensy LC version of the Cordstrum. Teensy 3.2 or LC microcontroller board is not included. You need to get that one elsewhere. This thing is super cool and sounds beautiful. I love it! I'm kinda sad that they're sold out and have been for a little while, it would be a shame if more people couldn't get one! I had contacted the seller when it was sold out a month ago. He responded promptly and was incredibly friendly. I purchased this the moment it went back on sale. It was shipped within a day or two. The project itself was fun to put together, and easy to set up using the guides online. I haven't messed with the midi controller function, but I'm having a blast with the headphone output (Teensy 3.2 required). I had no issues and would happily order whatever the seller cooks up next. Really neat project for my students to work with. High quality board, includes all parts needed and an extra button in case one broke / got lost! Seller had excellent communication and was very accommodating. Would definitely get more of these! Easy and fun to build, worked perfectly. Love the blend between music theory and electronics in a simple form factor. Love the PCB with touch-strip area. Nice project! I made a case for T. Chordstrum. This is a good product. Portable, good quality of sounds, easy to play! I published cover for T. Chordstrum. I used a Teensy 3.2 that I already had put full length pins on, so it stands a bit proud from the socket, but that probably made it a little easier to attach the two non-socket connectors underneath. The MIDI output works like a charm; the synthesizer is a lot of fun if a little noisy. If I use it for any kind of performance it'll be through a processing chain, so that's not a huge concern. I look forward to digging into the source code and playing further. All in all, a wonderful musical toy. The best thing I've ever purchased on Tindie! This kit is amazing, especially for the price! The assembly and instructions are straight-forward. The interface is very slick considering is just a bunch of charlieplexed buttons. 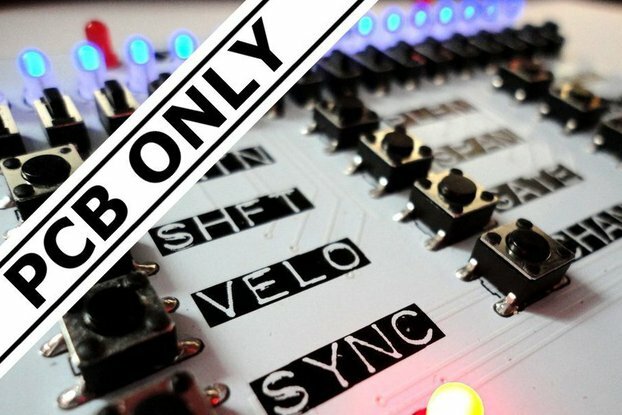 You can have seven different chord types by pressing the three buttons in binary patterns. And there's an entire menu built in. The built-in drum machine on the Teensy 3.2 version is incredible! Plus it acts as a MIDI device. Hooked it up to my MacBook running Garage Band, and it worked just fine over the MIDI USB. The code is very well written and streamlined. Can't say enough good things about Johan and his creations! I've been showing it off to all my music hacker friends, and they love it! Even convinced one to buy their own. Affordable device with features unique in it's class. Features found like pressing a chord then strumming in key, with little or no music experience may seem simple enough, but have not seen these features in any consumer products. Thank you Tindie for the ability to make these products available. In the audio aspect of the unit it has the ability to play chords, simple rhythm patterns, along with bass. The MIDI aspect of the unit, outputs the strumming pads only on MIDI channel 1. Although future programming could change at the time of this review. This is a great Tindie starter project and would recommend. Tindie needs more instruments like the Chordstrum! The Chordstrum is an easy and fast build that satisfies. The seller-developer ships quickly with absolutely everything needed except the Teensy, and is incredibly supportive after the sale if needed. This little instrument is a heck of a lot of fun with a lot of potential for both real music-making and customization, and every musician I've handed to has been fascinated by it. Having built Chordstrums with both the Teensy LC and Teensy 3.2, I would very strongly recommend using a Teensy 3.2, even though the build is just a hair more difficult with the two DuPont wires soldered to the underside of the MCU. Using the 3.2 not only gives you a basic but good-sounding little synth / auto-accompaniment engine for those times when you just want to jam without wiring up an external sound source, but also adds a lot more possibilities to hack the firmware to your liking (the all-important Set button can't be connected on the Teensy LC due to its smaller available-pin count). You won't regret spending the few extra bucks to put a 3.2 in the Chordstrum. Product works well my son ( 14years) is using it the whole weekend, had a little difficulty to get the Hex file into the teensy but managed in the end. Volumn is a bit low , i had to add a small amplifier to give it a bit more boost. all in all good buy for the price. I enjoy in this product! Using as midi+audio which is great for pocket, just plug in headphones or whatever and play! sound of harp/guitar is beautiful! This kit includes all the hardware needed to mount a Teensy 3.2 onto the board and play music with no MIDI input synthesizer needed to get it working. An easy build, just switches a capacitor and sockets. I had not used the Teensy 3.2 before this project. The extension for the Teensy in the Arduino IDE is easy to install - quite painless! Due to my inexperience with Teensy, Johan provided invaluable help, after which his code was successfully compiled and downloaded into the Teensy 3.2. However, Johan provides the Hex code which can be directly downloaded with the Teensy downloader. This is a great project, it works very well and the options available are great fun. To test the T.Chordstrum I used my HiFi iPOD input. I will be making a small battery powered amplifier with a speaker to make my T.Chordstrum portable. I have not yet tried the MIDI output as I do not have a synthesizer on my PC. T.Chordstrum has 2 instruments available and a number of rhythm sounds which are enough to start with. As Johan says it is like the Suzuki Omnichord.